"As darkness settled over the Great Glen I began to realise what a strange place I had come into. After sunset, Loch Ness is not a water by which to linger. The feeling is hard to define and impossible to explain. But there are reasons for all things and it is true that the soul of man was not forged in a day. Our genes have come down over a million years, from hutments and lake-dwellings, from dark gorges and cold caves. The seat of man's deepest instincts was planted sometime before the Pleistoscene; our subconcious has accumulated many strange impressions and none of these can be gainsaid. After dark I felt that Loch Ness was better left alone." So said Ted Holiday in his book, "The Great Orm of Loch Ness", over a generation ago in regard to his first expedition to the loch. I was not even born when Holiday arrived there in 1962. But this week I stood along the same stretch of lonely road fifty four years later and took the picture above as a nearly full moon shone upon the loch's wavering waters. However, the troubled thoughts Ted Holiday had concerning a dark Loch Ness did not really impact me as I stood there at about five thirty in the morning near the end of one of my regular night runs between Inverfarigaig and Dores. The road's official designation is the B852 but I nickname it "Monster Alley" due to its high proportion of reports of Nessie on land. 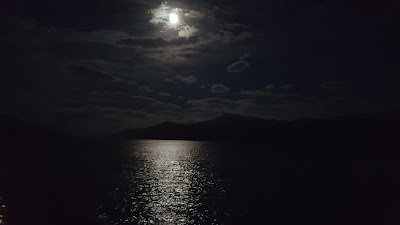 Of course, when one is on their own in moonlit darkness by the side of a loch with a monstrous reputation, they might feel some unease. There is the evil that lingers from Boleskine House just about a mile away plus nearby stories of necromancers and ghouls assaulting monster hunters. But, I think I was more inclined towards serenity as I scanned the peaceful scene before me and the waves lapping against the stones below what is called "The Wall". With the dashcam camera attached to the car windscreen, I recorded the whole trip and anything of interest that happened along the way. This nine mile stretch of road just before dawn is the best situation for witnessing a land sighting, though the odds are still very much against anyone being party to such an extraordinary prospect. It is a mystery within a mystery as to why these creatures make these rarest of rare appearances. The basics of such cases were laid out in this article, but since 1960 there has been only thirteen claimed land reports. That is about one every four years for the entire perimeter of the loch. Clearly, one should not bet the house on having such an experience even with the best intentions and preparation. That said, the raison d'etre behind these night runs is not just monstrous. I have been conducting deer studies as I plow these dark miles and now have a better understanding of the behaviour of deer in regard to the sceptical use of them in such monster cases. I will use these in future articles. A video of the same scene is below (though the uploaded video is never as good a quality as the original). More on my recent trip to Loch Ness will follow.